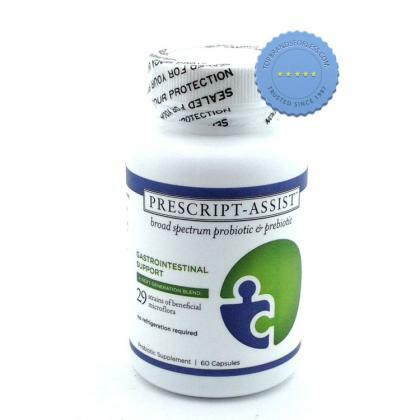 Help your body support balance after antibiotics or illness with Prescript Assist Probiotics 60s. It is made from soil based organism as opposed to the dairy sourced probiotic supplements, making it suitable for people with food intolerances, on a paleo diet, vegan and vegetarians. Digestive abnormalities may affect the level of good bacteria in our body. Good bacteria protects our body from being invaded by bad bacteria that can cause diseases. Prescript Assist Pre & Probiotics helps to restore a balance and get your gut back on side. Specially designed to manage hunger and cravings to promote reduced calorie intake. Dairy free because it is derived from soil based organisms and not from dairy cow. Supports the stomach by maintaining the healthy amount of good bacteria. Helps in healthy bowel function. Aids in stabilizing the absorption of nutrients inside the stomach. Contains 29 strains of symbiotic microflora. Made as gluten free, dairy free, and suitable for vegetarians. Specially formulated to restore the levels of good bacteria in the stomach. Each 600mg capsule of Prescript-Assist contains a proprietary blend of Leonardite, and the following microorganisms: Arthrobacter agilis, Arthrobacter citreus, Arthrobacter globiformis, Arthrobacter luteus, Arthrobacter simplex, Acinetobacter calcoaceticus, Azotobacter chroococcum, Azotobacter paspali, Azospirillum brasiliense, Azospirillum lipoferum, Bacillus brevis, Bacillus marcerans, Bacillus pumilus, Bacillus polymyxa, Bacillus subtilis, Bacteroides lipolyticum, Bacteriodes succinogenes, Brevibacterium lipolyticum, Brevibacterium stationis, Kurthia zopfii, Myrothecium verrucaria, Pseudomonas calcis, Pseudomonas dentrificans, Pseudomonas fluorescens, Pseudomonas glathei, Phanerochaete chrysosporium, Streptomyces fradiae, Streptomyces cellulosae, Streptomyces griseoflavus. For the first 30 days, take two capsules (one in the morning and one at night). And take one capsules a day thereafter or as directed by a medical health professional. Note you may experience gurgling or bloating in the stomach during this time. This is a good sign as it means their is action going on in your gut. Carefully read the label before using the product. Store in a dry place away from the reach of children. Zetop 10mg 10 Film Coated Tablets are an effective fast-acting, non-sedating antihistamine which helps provide relief from symptoms of seasonal allergic rhinitis.